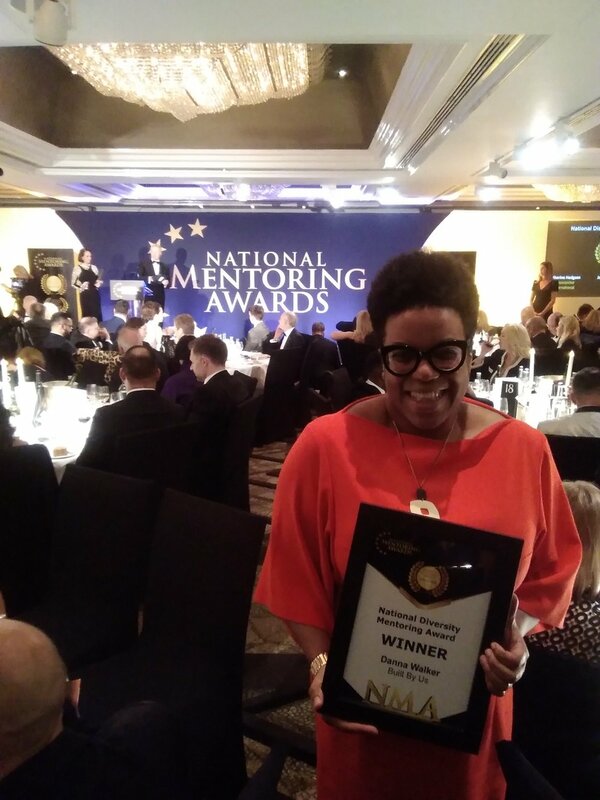 At the prestigious National Mentoring Awards gala held in London last week, founder of Brixton-based social enterprise BUILT BY US, Danna Walker, picked up Winner of the National Mentoring Awards 2019 in the Diversity Category for FLUID. Also founded by Danna Walker, FLUID is the mentoring programme which has been addressing the retention and development of talented practitioners from diverse backgrounds for management and leadership roles in the built environment since 2012. The programme facilitates the linking of volunteer mentors and mentees from across the construction industry to work on a one to one mentoring partnership over a 12 month period. It particularly seeks to support and encourage those under-represented in the professional and managerial disciplines including women, BME and LGBT practitioners, and professionals with disabilities and those from socio-economically disadvantaged backgrounds. Celebrating and honouring mentoring excellence, the National Mentoring Awards give public recognition to individuals and organisations who mentor across every sector of business, education, sport and society. This event marked a significant point in history where for the first time the UK’s mentors and mentoring organisations were honoured. The awards were hosted by three times BAFTA winner and the UK's top impressionist and comedian Rory Bremner, and founder and CEO of the National Mentoring Awards, Chelsey Baker, at the Jumeirah Carlton Tower in Belgravia, London, on Friday 1 March. The event was attended by over 300 of the UK’s top mentors, mentoring organisations, business leaders, government officials and CEOs. Following the event Danna Walker said “I am extremely proud of this award. FLUID is all about knowledge exchange, support, and role models. Applying to become a FLUID mentee is a positive step to empowering yourself to face challenges, gain insight and perspective, and to aspire.” She went on to say that she is “proud to run FLUID which is free to access and proud to work with our very supportive sponsors and partners, and I’m incredibly proud of the volunteer mentors who give their time to others, year after year and are essential to the success of the project”. FLUID Diversity Mentoring Programme sponsors and supporters include: EPR Architects, Make, Expedition Engineering, BUILD Studios, Architects for Change, Royal Institute of British Architects, Construction Industry Council, National Association of Women in Construction, and Women in Architecture.